This entry was posted on December 10, 2014 at 6:00 am	and is filed under Politics. Tagged: Florida, palm harbor, THE ARROGANCE OF THE LEFT, The Bryce is Right, tim bryce. You can follow any responses to this entry through the RSS 2.0 feed. You can leave a response, or trackback from your own site. No, they are exactly what Gruber called them: STUPID. Every person that never bothered to vote before came in droves to vote for Obama. Never mind that they had no idea who Joe Biden was, the person on the same ticket as Obama, never mind that they did not know what wealth distribution was, they only thing of of consequence–or not–is that they did know what candidate had a teenaged pregnant daughter at home. STUPID. Gruber was STUPID to open his mouth, but at least he told the truth. That is on all of those cable shows he went on but in front on Trey Gowdy, Gowdy ate him for lunch.If you do not know the issues, the previous votes of the candidates, and did they vote how they said they would vote, then educate yourself, of PLEASE, PLEASE STAY AWAY FROM THE POLLS! Gruber’s efforts to tap dance around his remarks, during recent testimony, by claiming “I’m not a politician,” but then using a neatly scripted (and obviously politically prepared) statement to apologize for his “mean and insulting” remarks, is just another proof that the Left does, indeed, believe that we’re stupid. Any means are justified, in their thinking, to bring about their enlightened ends. Two recommendations: an article by Victor Davis Hanson at NR, entitled “Lying for the Cause” (http://victorhanson.com/wordpress/?p=8073) and Tom Sowell’s classic on the fundamental differences between the worldviews of Left and Right: A Conflict of Visions. Yea, I was turned off by the scripted repetition as well. I found Gruber’s testimony to be “coached” in every way in that it followed that of Lois Lerner, Katherine Sebellius, and Hillary Clinton in its repetitious fashion of not providing any real answers and basically repeating the same thing in response to every question. Obviously Gruber never assigned himself the “moniker” of “Architect of Obamacare”–I suspect that came out of a Washington mouth because no one else knew enough about the legislation to make that observation other than Obama, Reid, or Pelosi. Still, it is obvious that the White House wanted to avoid making this a front line story of the day and once again aiming the spotlight at Obamacare. So, in typical Obama Administration philosophy (“never waste a good disaster”), they trot out the Senate findings on CIA torture as a distraction. That investigation was a sham from start to finish that took some staffer suppositions of a CIA report and turned them into conclusions. The rationale for the seriousness of it all was the fact that the report was supposedly based on an investigation of 119 prisoners suggesting that “torture” was employed on all of them. By all accounts only three ever received any significant level of discomfort in this process. The report is not worth the paper it is written on but it once again trashed America, rationalized our need to apologize to the world, and gave Obama the cover which he needed to slip out the back door yet again. 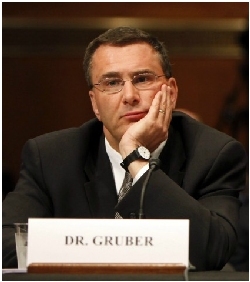 In my opinion Mr. Gruber is a “Goober to the Nth Degree” and surely received his PhD from the same company that gave us Obama’s long-form Hawaiian Birth Certificate. Are Americans stupid, well a large and getting larger portion of the population are stupid. The fault is with the Communist controlled Unions. Teachers pay has gone up dramatically while the SAT score are dropping like a rock. Every year it get worse. Basically skill like reading and writing are not a proficiency that is demanded to Graduate. With all these illiterate kids entering the workforce they will find anybody to hire them because, unless your picking crops there just are that many jobs they can do with being able to read and write. The numbers are staggering. The government and the Unions encourage this because educated people use more resources. Yes, that is the reason. I think the other reason is if the people are not educated they cannot study up on things that would be trouble for the government on a Federal level. This makes them more dependent on the government to support them. Regarding the Television Networks, there is little doubt the are government control and ruled by the left. You won’t find a real news there. As for Gruber it was obvious he had spent a lot of time with lawyer before testifying to get every word out correctly so nothing could be pinned on him. The Obama Administration had a lot to lose if he spilled the beans in the hearing. All of these thing together are a sign of a Socialist Society. This Administration (Obama specifically) has caused so may problems in the US and around the world by apologizing for the US to our enemy’s and giving them large sums of money to attack our only ally in the Middle East, Israel. In addition, when more than 50% of the population works for the government you are a socialist society. We are at around 56% right now. Most businesses are not expanding because of the regulations being place on them by Obama and the uncertainty of the future that they are just trying to hang on until things get better. They won’t. I am convinced that our President Obama is actually a Muslim (5 years in a Muslim school in Indonesia, his father was a Muslim), a socialist (close ties with the Democratic Society of America (DSA) that is a communist organization. He has won awards from them and been involved with them since his 20’s), and is not a US citizen (fake documents, he was not born here, BS story and he was born in Indonesia, you had to be a citizen to attend school there because it was a very poor country. As I mention he spent 5 years in school there. Since he was born there he would not get citizenship automatically from his Mother since she was a US citizen, because she denounce her US citizenship, thus not making him a US citizen). If you look at what he has done since he has been in office knowing these things about him, it is very clear what his plan is to destroy the United States. “Not necessarily, but they may have a bit of the blonde gene, my wife would say, being a beautician. Especially after 9-11. Let me explain. Just before this sad chapter in our American landscape, folks were burning American flags across the country. No more pledge of allegiance, and no God in schools. Patriotism was being tossed around like a rag doll. Shame on most Americans. Immediately following 9-11, every one was returning to the flag and saluting it. American pride was on the rise. Wasn’t long after the LGBT movement and the whole abortion on demand crap being legalized, the Godly began to take a back seat, shame on them for not speaking up. Where are these Godly leaders today? We’re back to “Down with America, policemen, and our border patrol.” ROME is burning, I though I smelled something . Change is coming, but Obumbler is about to receive a wake up call. If we allow this guy to finish his term and receive an undeserved Presidential pension, then yes, Americans are truly stupid. “Sadly, Gruber was only speaking the truth. I wish it were otherwise. Seriously, look at the passage of the ACA. Count the votes. How many even read the legislation let alone understood it. It takes a special kind of stupid to represent people in Congress that poorly. I hear that the Republicans are bragging that they didn’t vote for it. Sadly, I expect they would of had their party been sponsoring the ACA. Ultimately, the blame falls at the feet of the American voters, the ones who selected these fools to represent them. They’ve been duped. Progressives have been whittling away at the core of our citizenry for a long time now. One of their greatest successes was the abandonment of civics classes in our schools. Voters with no concept of constitutional law have little hope of choosing wisely. Another important factor in the progressive strategy has been to dominate the halls of learning which has allowed them to infuse propaganda into almost every class. They have played on children’s nature inclination to rebel to guide them into new ways of thinking, into servility. And yes, critical thinking requires courage, the ability to do what is necessary, to explore uncomfortable ideas in spite of our fears. Americans were once proud of their rugged individualism. We are hardly rugged or individualists anymore. Sad. “No, Americans are not stupid but our government is. What government would release CIA documents that expose American investigation behaviors and techniques? THE ACR is a failure, so the President is grasping at anything and any agency which he can condemn. He’s the epitome of Dichotomy in Political behavior, the most divisive and destructive president. Vindictively out for Blood, his Hubris is only exceeded by his obvious attempts to distract the politics of the day over to his side of the conversation. The President along with the Democrats in the Senate are Stupid and this will come with consequences down the road. Politics have hit an all time Low. Should the next president along with a Republican Congress and Senate, Abolish the CIA? “We elect our representatives to go through these bills and not vote to see what is in them. I think people get frustrated with both parties as they do not seem to look out for any of our interests. Heck when was the last time the Senate took out a bill to vote on? The voters sent a mandate to the conservatives and already they are allowing bills to be written for them with no change to the budget until September/October of next year. Exempt possibly amnesty. Pass a continuing Resolution until January or February and address these items with the new Congress instead of right now. There are so many crises situations as of late – or – by design that it is hard for working people to keep up with it all. “‘The arrogance of the Left’ is a redundancy. With very few exceptions, I have found that liberals/progressives/socialists whatever believe that they are better than everyone else. How else can you explain their assumption that they should have prior claim to decide how your money is spent? Over my lifetime of 70 years, I have found that liberals are the most intolerant self-righteous, arrogant, condescending, smug and judgmental people I have ever known.